Is the Otto family still sticking out like a sore thumb in Westport, Connecticut? Has the American Housewife TV show been cancelled or renewed for a fourth season on ABC? The television vulture is watching for the latest cancellation and renewal news, so this page is the place to track the status of American Housewife, season four. Bookmark this page, or subscribe for the latest updates. Remember, the television vulture is watching your shows. Are you? An ABC single-camera comedy, American Housewife stars Katy Mixon, Diedrich Bader, Meg Donnelly, Daniel DiMaggio, Julia Butters, Carly Hughes, and Ali Wong. The sitcom centers on Katie Otto (Mixon). As an average wife and mother, she prefers to stand apart from Westport CT’s “perfect” parents and their entitled children. Katie’s logic-driven husband, Greg (Bader), supports her efforts as best he can. Together, they try to make sure that their kids, Taylor (Donnelly), Oliver (DiMaggio), and Anna-Kat (Butters) internalize the family’s values, so they don’t end up carbon copies of their neighbors. The third season of American Housewife is averaging a 0.95 rating in the 18-49 demographic and 4.21 million viewers. Compared to season two, that’s down by 22% and 8% respectively. Check out how American Housewife stacks up against other ABC TV shows. 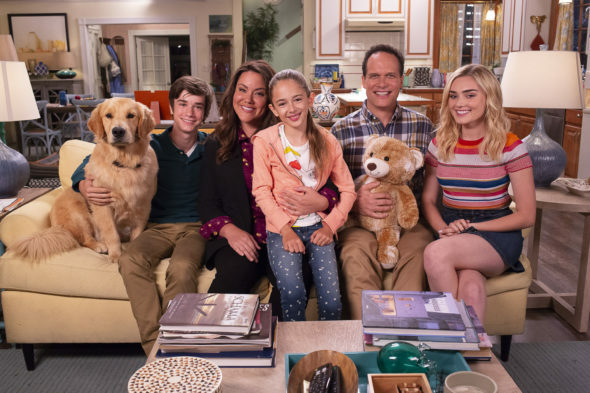 As of American Housewife has not been cancelled or renewed for a fourth season. Stay tuned for further updates. Will ABC cancel or renew American Housewife for season four? The ratings are pretty good, compared to the rest ABC’s slate. If renewed, the series will have enough episodes for syndication so I think it is safe. For now, I’ll keep an eye on the Nielsens and update this page from time to time. Subscribe for free updates on any American Housewife cancellation or renewal news. TV show ratings are still important. Follow American Housewife’s weekly ups and downs. Check the rankings for all ABC TV shows. Read other American Housewife TV series news or other ABC TV show news. What do you think? Should the American Housewife TV series be cancelled or renewed for season four? How long do you expected this ABC sitcom to last? American Idol on ABC: Cancelled or Renewed for Season 18? American Idol: Cancelled or Renewed for Season 17 on ABC? Please dont cancel the show….I absolutely love this show….she is a real housewife/mom people can relate to. Please don’t cancel this show!!! Yes!!! PLEASE PLEASE PLEASE PLEASE PLEASE DONT CANCEL THIS SHOW!!! WE LOVE IT SO MUCH SO PLEASE KEEP IT!! I LOVE American Housewife! They give these “ratings” but no one has ever asked ME what shows I like. I think MOST of these comedies are awful, but I love this one. I LOVE American Housewife! I never miss an episode. I schedule my errands around it So I can watch it live. Katie is a trip. Actually I love all the cast. They have grown to fit/accent each other. I like seeing Anna Cat growing up. I could go on & on. Her friends are a hoot. Greg is just so easy going-which is perfect for this family. It gets better the more I watch. Renew for a 4th season, and beyond.